The Ray and Maria Stata Center or Building 32 is a 720,000-square-foot (67,000 m2) academic complex designed by Pritzker Prize-winning architect Frank Gehry for the Massachusetts Institute of Technology (MIT). The building opened for initial occupancy on March 16, 2004. It sits on the site of MIT's former Building 20, which had housed the historic Radiation Laboratory, in Cambridge, Massachusetts. The building's address is 32 Vassar Street. In contrast to the MIT custom of referring to buildings by their numbers rather than their official names, the complex is usually referred to as "Stata" or "the Stata Center" (though the building number is still essential in identifying rooms at MIT). Above the fourth floor, the building splits into two distinct structures: the Gates Tower and the Dreyfoos Tower, often called "G Tower" and "D Tower" respectively. The building has a number of small auditoriums and classrooms used by the Electrical Engineering and Computer Science department (EECS, Course 6), as well as other departments and on-campus groups. Research labs and offices of the Computer Science and Artificial Intelligence Laboratory (CSAIL), the Laboratory for Information and Decision Systems (LIDS), as well as the Department of Linguistics and Philosophy (Course 24) occupy the upper floors. Academic celebrities such as Noam Chomsky and Ron Rivest, World Wide Web Consortium founder Tim Berners-Lee, and free software movement founder Richard Stallman also have offices in the building. A wide main passage running the length of the building on the ground floor is called the Charles M. Vest Student Street, in honor of the former MIT president who died in December 2013. The Student Street is often used as a more-spacious substitute or extension for the Memorial Lobby located in Building 10 on the Infinite Corridor. The monthly "Choose to Re-use" community recycling swap fest, and a weekly fresh produce market are other events regularly held in the Stata Center. One of five MIT Technology Childcare Centers (TCC) is located at the western end of the ground floor. The Forbes Family Cafe is located at the eastern end, and serves coffee and lunch to the public during office hours. The MIT Museum maintains some historic displays on the ground floor of the Stata Center. A few selected larger relics of past hacks (student pranks) are now on semi-permanent display, including a "fire hose" drinking fountain, a giant slide rule, and full-size replicas of a cow and a police car which had been placed atop the Great Dome (though not at the same time). In the ground floor elevator lobby of the Dreyfoos Tower are located a large time capsule box plus informational panels describing MIT's historic Building 20, which the Stata Center has replaced. Major funding for the Stata Center was provided by Ray Stata (MIT class of 1957) and Maria Stata. Other major funders included Bill Gates, Alexander W. Dreyfoos, Jr. (MIT class of 1954), Charles Thomas "E.B." Pritchard Hintze (an MIT graduate, and of JD Edwards, now Oracle Corporation), Morris Chang of TSMC. and Michael Dertouzos. The Stata Center is located on the site of the former Building 20, demolished in 1998. Building 20 was erected hastily during World War II as a temporary building to house the historic Radiation Laboratory. Over the course of 55 years, its "temporary" nature allowed research groups to have more space, and to make more creative use of that space, than was possible in more respectable buildings. The building also provided permanent rooms for official Institute clubs and groups, including the Tech Model Railroad Club and the Electronic Research Society. Professor Jerome Y. Lettvin once quipped, "You might regard it as the womb of the Institute. It is kind of messy, but by God it is procreative!" Boston Globe architecture columnist Robert Campbell wrote a glowing appraisal of the building on April 25, 2004. According to Campbell, "the Stata is always going to look unfinished. It also looks as if it's about to collapse. Columns tilt at scary angles. Walls teeter, swerve, and collide in random curves and angles. Materials change wherever you look: brick, mirror-surface steel, brushed aluminum, brightly colored paint, corrugated metal. Everything looks improvised, as if thrown up at the last moment. That's the point. The Stata's appearance is a metaphor for the freedom, daring, and creativity of the research that's supposed to occur inside it." Campbell stated that the cost overruns and delays in completion of the Stata Center are of no more importance than similar problems associated with the building of St. Paul's Cathedral. The 2005 Kaplan/Newsweek guide How to Get into College, which lists twenty-five universities its editors consider notable in some respect, recognizes MIT as having the "hottest architecture", placing most of its emphasis on the Stata Center. An architecture that reverses structural algorithms so as to create disorder—the same algorithms that in an infinitely more detailed application generate living form—ceases to be architecture. Deconstructivist buildings are the most visible symbols of actual deconstruction. The randomness they embody is the antithesis of nature's organized complexity. This is despite effusive praise in the press for "exciting" new academic buildings, such as the Peter B. Lewis Management Building at Case Western Reserve University in Cleveland, the Vontz Center for Molecular Studies at the University of Cincinnati Medical Center, and the Stata Center for Computer, Information, and Intelligence Sciences at MIT, all by Frank Gehry. Housing a scientific department at a university inside the symbol of its nemesis must be the ultimate irony. Former Boston University president John Silber said the building "really is a disaster". Architecture critic Robert Campbell praised Gehry for "break[ing] up the monotony of a street of concrete buildings" and being "a building like no other building". The style of the building has been likened to German Expressionism of the 1920s. 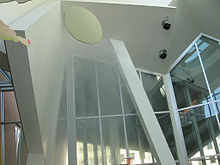 On October 31, 2007, MIT sued architect Frank Gehry and the construction companies, Skanska USA Building Inc. and NER Construction Management, for "providing deficient design services and drawings" which caused leaks to spring, masonry to crack, mold to grow, drainage to back up, and falling ice and debris to block emergency exits. A Skanska spokesperson said that, prior to construction, Gehry ignored warnings from Skanska and a consulting company regarding flaws in his design of an outdoor amphitheater, and rejected a formal request from Skanska to modify the design. In a 2007 interview, Gehry, whose firm had been paid $15 million for the project, said construction problems were inevitable in the design of complex buildings. "These things are complicated", he said, "and they involved a lot of people, and you never quite know where they went wrong. A building goes together with seven billion pieces of connective tissue. The chances of it getting done ever without something colliding or some misstep are small". "I think the issues are fairly minor", he added. "M.I.T. is after our insurance." Mr. Gehry said that value engineering—the process by which elements of a project are eliminated to cut costs—was largely responsible for the problems. "There are things that were left out of the design", he said. "The client chose not to put certain devices on the roofs, to save money." The lawsuit was reportedly settled in 2010 with most of the issues having been resolved. ^ Chandler, David L. (March 7, 2014). "MIT community celebrates the life of Charles M. Vest". MIT News. Retrieved 2014-05-17. ^ Garfinkel, Simpson. "Building 20: the Procreative Eyesore". Technology Review. 94 (November/December 1991): MIT11. ^ "Quotes and Stories about Building 20". MIT Libraries, Massachusetts Institute of Technology. 1998-03-02. Retrieved 2007-09-23. ^ Robert Campbell (April 25, 2004). "Dizzying heights - In Frank Gehry's remarkable new Stata Center at MIT, crazy angles have a serious purpose". The Boston Globe. ^ Kantrowitz, Barbara (August 2004). "America's 25 Hot Schools". Newsweek via MSNBC.com. Microsoft Corporation. Archived from the original on 2007-09-03. Retrieved 2007-09-23. ^ Salingaros, Nikos (2007). Anti-Architecture and Deconstruction. Umbau-Verlag. ISBN 3-937954-09-0. ^ Silber, John (2007). Architecture of the Absurd: How "Genius" Disfigured a Practical Art. Quantuck Lane. ISBN 978-1-59372-027-8. ^ a b c Murphy, Shelley (November 6, 2007). 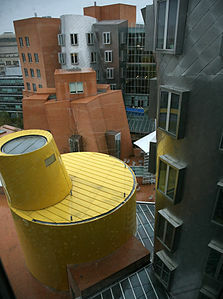 "MIT sues Gehry, citing leaks in $300m complex; Blames famed architect for flaws at Stata Center". The Boston Globe. The New York Times Company. Retrieved 2007-11-06. ^ Lienhard, John H. (2004-08-01). "No. 2521: Radical Buildings". Engines of Our Ingenuity. University of Houston (www.uh.edu). Retrieved 2012-03-24. ^ Dey, Arkajit (November 9, 2007). "MIT Sues Gehry Firm Over Stata Problems; Lawsuit Describes Persistent Leaks, Sliding Ice and Snow, and Cracking Masonry". The Tech. p. 1. Retrieved 2007-11-09. ^ Glahn, Lisa F. of Mintz Levin (October 31, 2007). "Massachusetts Institute of Technology v. Frank O. Gehry & Associates, Inc., n/k/a Gehry Partners, LLP and Beacon Skanska Construction Company, n/k/a Skanska USA Building, Inc" (PDF). The Tech. Retrieved 2007-11-09. ^ Robin Pogrebin and Katie Zezima (November 6, 2007). "M.I.T. Sues Frank Gehry, Citing Flaws in Center He Designed". The New York Times. The New York Times Company. p. A19. Retrieved 2007-11-07. ^ "MIT Computer Science and Artificial Intelligence Laboratory | CSAIL". Csail.mit.edu. Retrieved 2012-03-24. ^ "Information Intersection - Stata Center: MIT Libraries". Libraries.mit.edu. Archived from the original on 2012-04-14. Retrieved 2012-03-24. Joyce, Nancy E. (2004). Building Stata: The Design and Construction of Frank O. Gehry's Stata Center at MIT. afterword by William J. Mitchell, photography by Richard Sobol. Cambridge, Massachusetts: The MIT Press. ISBN 978-0-262-60061-3. Mitchell, William J. (2007). Imagining MIT: Designing a Campus for the Twenty-First Century. Cambridge, Massachusetts: The MIT Press. ISBN 978-0-262-13479-8. 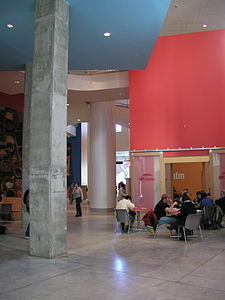 Wikimedia Commons has media related to MIT Stata Center. 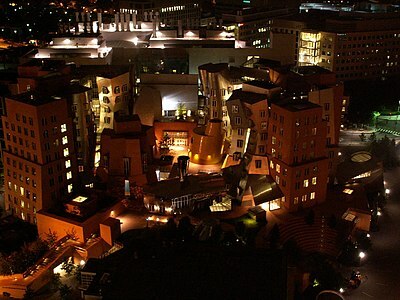 "Stata Center". MIT Department of Facilities, Massachusetts Institute of Technology. Retrieved 2007-09-23. "A multimedia walking tour of the Stata Center". Untravel Media, Massachusetts Institute of Technology startup. Retrieved 2008-06-19. "Ray and Maria Stata Center". MIT Computer Science and Artificial Intelligence Laboratory, Massachusetts Institute of Technology. Archived from the original on 2007-09-18. Retrieved 2007-09-23. Reiss, Spencer (May 2004). "Frank Gehry's Geek Palace". Wired, CondéNet Inc. 8 (12.05): 518. doi:10.1007/s11916-004-0076-y. Retrieved 2007-09-23. Beam, Alex (2004-05-04). "After buildup, MIT center is a letdown". The Boston Globe. The New York Times Company. Retrieved 2007-09-23. Ted Smalley Bowen (2004-05-19). 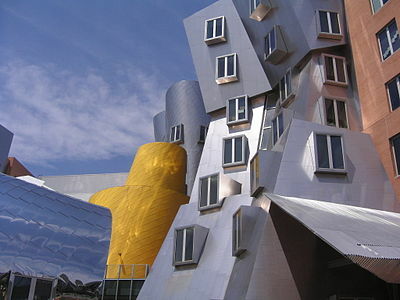 "MIT's Stata Center Opens, Raises Questions about Cost Control". Architectural Record. The McGraw-Hill Companies, Inc. (construction.com). Archived from the original on 2007-09-29. Retrieved 2007-09-23. Wollman, Garrett A. (2005-12-20). "Building MIT's Stata Center: An IT Perspective" (KPresenter). Lisa'05 Conference Proceedings. USENIX (usenix.org). Retrieved 2016-11-28. Virtual tour: MIT Computer Science and Artificial Intelligence Laboratory (n.d.). "CSAIL Lab Virtual Tours - Information Desk". Archived from the original on 2006-04-27. Retrieved 2006-12-26. "Campus Map: Building 32 (Ray and Maria Stata Center)". MIT Department of Facilities and Information Services & Technology, Massachusetts Institute of Technology. Retrieved 2007-09-23. This page was last edited on 18 March 2019, at 01:50 (UTC).